Dr. Charles Tucker graduated in 1979 from Palmer College of Chiropractic in Iowa and has been practicing in Gainesville, FL, since 1981. Over the years, Dr. Tucker has provided care to more than 10,000 individual patients and has performed more than 100,000 individual treatments on patients as young as 1 month old and as advanced as 93 years old. Since moving to Gainesville in 1981, Dr. Tucker has since helped thousands of people in the community to live healthier, pain-free lives. Originally from Iowa, Dr. Tucker was first introduced to chiropractic care by his parents after he was hit by a car when he was in the third grade. The trauma he experienced left him with a whiplash injury that caused him to develop migraine headaches at the age of 11. Chiropractic was the only treatment that helped the pain. After walking out of the chiropractor's office without a headache, it was then that the young Dr. Tucker knew he wanted to become a chiropractor when he grew up. And after more than 30 years in practice, he still LOVES his job! It makes him very happy when a returning patient tells him that he has helped to reduce or eliminate their pain. After six years of education, Dr. Tucker graduated from Palmer College of Chiropractic in 1979 with a degree to practice Chiropractic. During his schooling, he completed 420 college credits and took over 90 individual courses totaling a cumulative 4,500 class hours. Upon completion and graduation, Dr. Tucker sat and passed the National Boards prescribed by the National Board of Chiropractic Examiners. The successful passing of these boards qualifies a Doctor of Chiropractic to apply for each individual State Board. 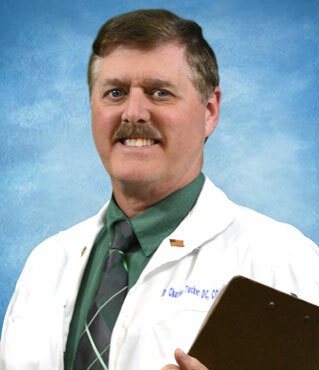 Dr. Tucker holds a state license in Florida having passed testing and licensure requirements. Due to working and/or coordinating chiropractic care for numerous sporting events, Dr. Tucker was chosen to treat athletes participating in the 1996 Atlanta Olympic Games. He is also currently working on a nutritional certification through the American Clinical Board of Nutrition.